After reading the fantastic book, Your Money or Your Life, I decided we should start tracking all our spending. We started doing that this past month, and now have a full month of data to break down and analyze. I did all my tracking on Google Docs, recording the date, what was purchased, the main category and sub-category, and then the total of the bill, and any break-down amounts if the bill contained things in different categories or sub-categories. Last night I finally dealt with all the data, and it was an eye-opening experience. Until you try to parse your data, you won’t see how you actually should be recording your raw data. I started by making a duplicate sheet of my spending sheet, so I could play with it without losing any of my data. Then I stripped off the date column and the description column. I was left with the category and sub-category, sub-category amounts and total amounts. I then sorted by category so that I could then do the breakdowns. What I figured out pretty quickly was that I had a few things I had neglected to enter a category for, so I had to go back and enter a category so those items didn’t get lost. I also figured out that where I had put the total of the bill and then the breakdowns, things were getting screwed up. So I left in the break-downs (must make sure from now on that all breakdowns account for the whole bill!) and took off the bill totals, since they had not been categorized anyway. The other tweaking I did was to figure out some better categorization. This happened quite naturally after seeing the kind of spending, and simply standardizing some things. Once I had my categories, I sorted A-Z by the category names, and then totalled up for each category. In my breakdown sheet I now have category in column A, sub-category in column B, category name (again-for the purpose of the chart) in column C, and in column D, the totals for each category. I got those by doing a SUM equation to add up all the spending for each category. 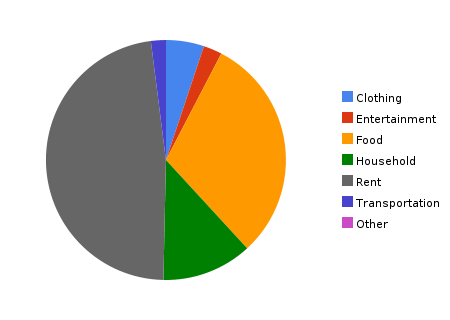 For anything I wanted to do more of a breakdown for, I put the sub-category totals in column F, with their titles in column E.
Finally, I made a pie chart for kicks to see where our money is going. Very instructive! I learned that our grocery budget for this month was pretty good, and that we’ve really brought my husband’s lunch spending down significantly. It will be interesting to see how we do next month. Our household expenses were sortof high, as we had to buy a car seat this month. But in general, we are not big spenders. There was not a lot for entertainment, or clothing. So the goal for next month will be to challenge our food spending, though this might be hard as we are going to be doing some traveling. I highly recommend doing this kind of tracking. It is highly instructive to see where your money is going. The next step will be figuring out my husband’s “real wage”, and then assessing the spending in each category to see if it’s all been worth it. We also have to get our wall chart set up. Both of these things are quite exciting, and although we aren’t doing this today, at least we have the raw data to be able to do it later. I’m going to continue with this, and I’ll make some sample data to show you how I did it. I’ll let you know when I have the sample up!